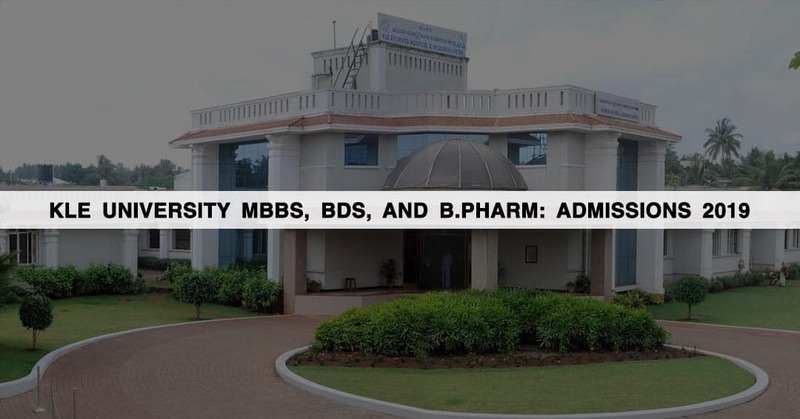 KLE University was established in 1963 in Belgaum. The University has collaborated with national and international bodies such as ICMR, WHO, University of Illinois, Chicago USA, University of Missouri, Kansas City USA for teaching and research. Admission to all the above-mentioned programmes is done on the basis of marks scored by the candidate in KLEU-UGAIET Exam and their qualifying degree merit. Candidate must have passed HSC examination PUC II/HSC or ICSE or any other equivalent 10+2/HSC examination recognized from any Indian/abroad school/college after 12 years of study. Candidate must have passed the subjects of English, Physics, Chemistry, and Biology individually with minimum 60% marks in Physics, Chemistry and Biology taking together in examination i.e. PUC II/HSC/10+2 or equivalent. Candidate must have passed Physics, Chemistry, and Biology taken together in KLEU-UGAIET Exam with at least 50% marks. Candidate must have passed English, Physics, Chemistry and Biology individually with minimum 50% marks in Physics, Chemistry, and Biology taking together in examination i.e. PUC II/HSC/10+2 or equivalent. Candidate must have passed 2 years PUC examination of Karnataka or equivalent examination of any board or university with Physics, Chemistry as compulsory subjects along with one of Mathematics/ Computer Sciences/ Biotechnology/ Biology or PCMB with at least 40% marks. Candidates who possess 2 years lateral entry in B. Pharm or D. pharm from PCI approved institute must have minimum 50% of marks. Candidates who have scored 40% marks in 10+2 but have completed B.Sc. degree with chemistry as compulsory subject with combination of any two of the following subjects: Physics or Mathematics or Microbiology or Botany or Zoology or Biotechnology or Computer Science or Electronics.5% relaxation is provided in minimum eligibility criteria to candidates who belong to reserved category. Candidate must have passed English with minimum 40% marks in PCB in 10+2. 5% relaxation is provided in minimum eligibility criteria for SC/ST candidates. Candidate must have passed English with minimum 50% aggregate of marks in PCB in 10+2. Candidate must have passed English with minimum 40% and above marks in PCB in 10+2 qualifying examination. 5% relaxation is provided in minimum eligibility criteria for SC/ST candidates. Candidate must be physically fit and certificates should be issued by Registered Medical Practitioner. Candidates can download admission form directly from the official university website and submit the same along with the application fee through online payment mode. University will not refund application fee in case of duplication of application and bank transaction failure.